Contrary to popular belief, GPA isn’t forever. Grade point average is just another number. It was so easy for me to define myself by numbers, GPA being one of them. One of Cosmo’s recent articles, “11 Numbers That Don’t Define You” opened my eyes and shed new light on a topic we don’t talk about enough. 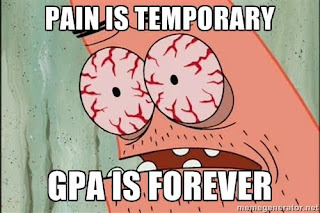 The meme pictured above states, “Pain is temporary, GPA is forever.” This phrase has made its way around Twitter, and it has struck a nerve with me. In the past, I let my GPA control my life at a debilitating level. My grades and the number on the scale were the only things that defined my self-worth. If I didn’t get an A, I wasn’t perfect. If I weighed more than X amount, I wasn’t worthy of love. If I wasn’t perfect or worthy of love, I wasn’t happy. There’s a time and place for numbers. From personal experience, particular numbers have led to unrealistic and unattainable goals. I held many false perceptions about numbers. I used to think, “When I turn 18 I will be happy.” I would also say, “When I have a 3.764 GPA, my worries will disappear.” With me, the truth behind numbers is scary; there will always be a “better” number. Once I would hit my goal, I was happy for a couple of days and then began to self-sabotage even more to meet the next one. When I took a break from school last fall, it finally hit me. My GPA will NEVER lead me to happiness or even success. It just won’t. My grades are not a measure of my character or hard work. They do not show the countless hours I give back by volunteering or the time I spend taking care of myself and others. My aspirations are far beyond my college GPA. I no longer limit my life to numbers, and it feels good. For me, happiness will never be found in any number. Happiness doesn’t automatically hit at a certain age, GPA, or number on the scale. The pursuit of happiness is when happiness occurs. When you follow your dreams and do what you are truly passionate about happiness and joy become abundant and overflowing.